With their long, dangling flowers and exuberant growth, angel’s trumpets (Brugmansia) bring a touch of the tropics wherever you grow them. Sometimes confused with their close cousin Datura, Brugmansia flowers droop whereas Datura flowers are upright. Angel’s trumpets grow into an evergreen shrub or small tree in Florida but are normally used as pot plants elsewhere in the country. The Florida Museum of Natural History recommends angel’s trumpets for attracting butterflies into your garden. 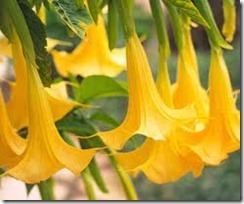 Angel’s trumpets have large, dangling flowers. Grow angel’s trumpets in full sun for best flowering, although they tolerate light shade. Native to South America, these are heat-loving plants. They grow best in moist, slightly acid, organic soil. Angel’s trumpets grow into woody shrubs or trees in the warmer parts of their range, but act like perennials in cooler areas, dying back to the roots after frost and then putting up new shoots in the spring. Brugmansia is hardy in USDA plant zones 8 to 11. The University of Vermont suggests propagating them by rooting semi-hardwood cuttings in summer. The seeds are often sterile and won’t germinate. You will find both species plants and named cultivars offered for sale. The red angel’s trumpet (B. sanguinea) is an award-winning species with 9-inch long, orange-red flowers with yellow-green at the base and yellow veins. B. aurea has 9-inch, white to golden yellow flowers that are fragrant at night. The hybrid B. x insignis has pink or white flowers up to 16 inches long. Choice cultivars include Golden Queen, with scented, soft yellow flowers, and Knightii, another award-winner with double yellow flowers. Charles Grimaldi has an abundance of large, salmon-colored flowers. Two cultivars with variegated leaves are Peaches and Cream, with peach-colored blooms, and Variegata, with apricot flowers. Angel’s trumpets are part of the nightshade family (Solanaceae). The flowers, leaves and seeds of angel’s trumpets are poisonous, so use this plant with care in gardens accessible to children or pets. Symptoms of toxic exposure include hallucinations, muscle weakness, dry mouth, fever, increased blood pressure and pulse, dilated pupils and paralysis. You can be affected both by ingesting plant parts or by inhalation of the flowers. Never add any part of angel’s trumpet to compost piles since the poisonous alkaloids do not break down.